DG: In my experience, self esteem is gained by doing esteemable actions. That could look like living in your integrity and with great compassion for yourself – especially and particularly when you feel most unlovable. Please commit to a 15 minute brisk walk every single day, no matter the weather, for 90 days. On these walks, pick up a stone and put it in your pocket. When you arrive home, make a mark on it. Use a Sharpie or some other permanent way of marking. Collect them in a jar that you keep by your mirror. At the end of 90 days, continue your walks except put a stone in a place that calls to you. On that 90th (180th) day of walks, deliver your last stone to someone who is suffering. DG: Think back to a time when you were brand new at something and completely failed and/or felt embarrassed or ashamed. Have it? First, take comfort in knowing that this question could be asked to absolutely anyone, aged 5 or older, and they would have such a memory. That pain and fear connect us. Please hold that memory – that pain – and then take the hand of the you you were then. Invite that you indoors into your most favorite sitting place. Is that you very young? Offer your lap. If not, offer him/her a cup of something delicious and get one for your current you, too. Are you warm and comfortable? Now what will you say to your earlier you to comfort him/her? I bet it’s kind and encouraging. Compassionate. Listen to your own words. On a day not too long from today, take yourself, by yourself, to one of your most favorite place. Take with you a small spade or spoon and a clear jar with a lid. When you arrive at this special place, say out loud, “I am new again. I feel afraid, but I am courageous. Thank you fear for trying to protect me, but I got this.” Plunge your space into the earth then place its contents in the jar. Put the lid on the jar and carry it home. Once home, put the jar by the place you sleep. Let the soil of your special place help ground you. 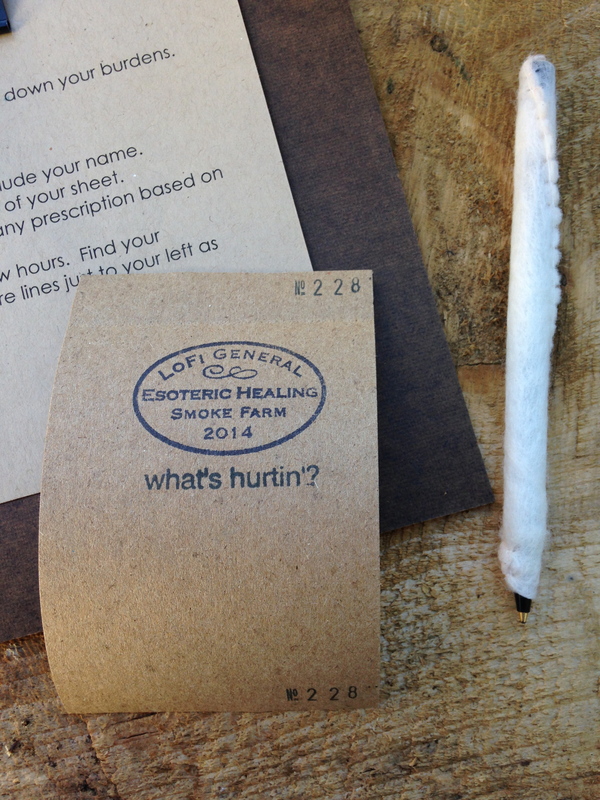 *Had you received this prescription at the farm, you would have also received this token. If you wish to have this token, please send me an email at info@wylyastley.com for instructions on how to get it. Thank you. 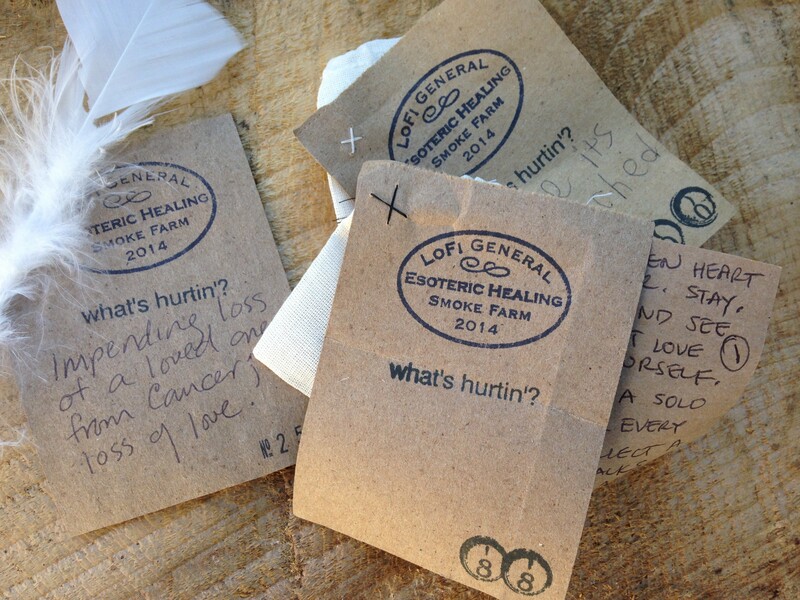 Following are “prescriptions” to ailments/burdens that were left with me in my ad hoc apothecary at Smoke Farm on September 6 – 7, 2014. My ambition in offering these prescriptions was (and remains) to connect with people who were willing to become vulnerable with a complete stranger – to be witnessed and figuratively held by someone who cares deeply. Please know that I am not a trained counselor or healer. I am an artist. I created a space and circumstances that I hoped would elicit an exchange of trust and connection between strangers thus creating a significant relationship, an “us”, if only for a moment. I found that a majority of participants were willing to be incredibly forthcoming in sharing pain. In my own experiences and in the feedback I have received so far, it appears that this experiment was successful. Connections were made. I was not able to fill all the prescriptions I received during “office hours”, therefore, I brought the project online. While I did not write prescriptions in numerical order at the festival, I will do so here until they are all filled. You may note that many numbers are missing and that there is a pair of identical numbers (1). The missing numbers represent prescriptions that were picked up during the festival. In the prescriptions offered at the Farm, I gave a token “remedy” to be used in the prescription. I am happy to offer tokens to anyone who wants them. Please contact me at info@wylyastley.com for instructions on how to receive one. Thank you participants. It is a joy to connect. DG: Your heart is a magic, sacred place. It holds the truth. Your head wants to protect your heart. It despises pain and all things it doesn’t understand. Fear often masquerades as Protection. See the truth. Courageously take the reins from the fear. Take this [a] feather to the [a] river, hold it in your right hand and recite, “Fear – thank you for your energy. Your services are no longer required.” Release the feather (fear) into the river. DG: Now is a wonderful time to reconnect with yourself – to relearn what you enjoy and want to learn. Think back to a time when you experienced great joy when you were alone. What were you doing? Seeing? Tasting? Schedule a date with just you and try that thing again. Also, schedule a daily 15 minute walk with yourself. Do this for 90 days no matter the weather. While on your walk select and pocket a special rock you find along the way. Collect these rocks in a jar that you keep next to where you sleep. Let the weight of the stones help ground you and remind you of your commitment to befriending yourself. Last weekend I built an apothecary in a cedar grove. I dressed myself in silk and wool, covered my eyes with a mask of branches that limited my vision downward and played the role of a shaman named Dr. Good. “Patients” participated in the process by writing downaches and pains of the heart or mind – spiritual burdens. Once they finished writing, they removed and pocketed a numbered portion of the chit and deposited their identically numbered burden in a jar. 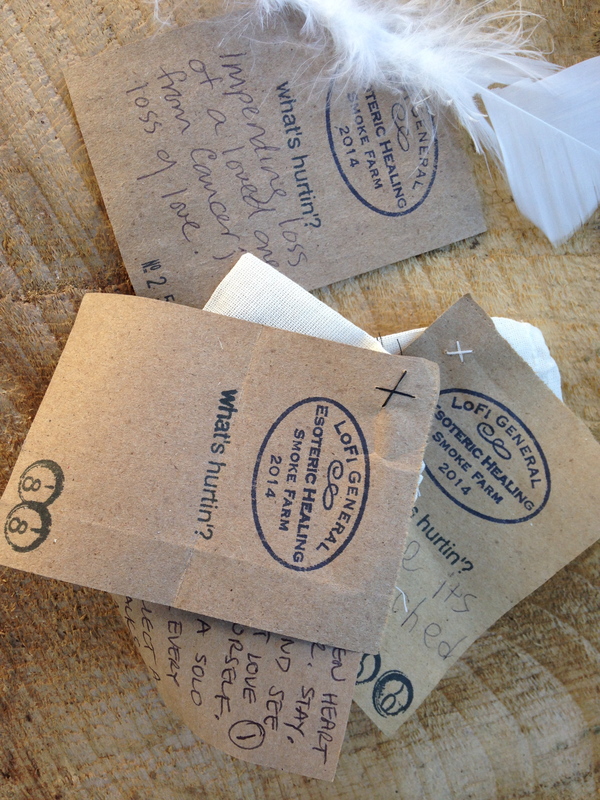 They had instructions to return in a few hours to receive a “prescription” and remedy for their heartache. 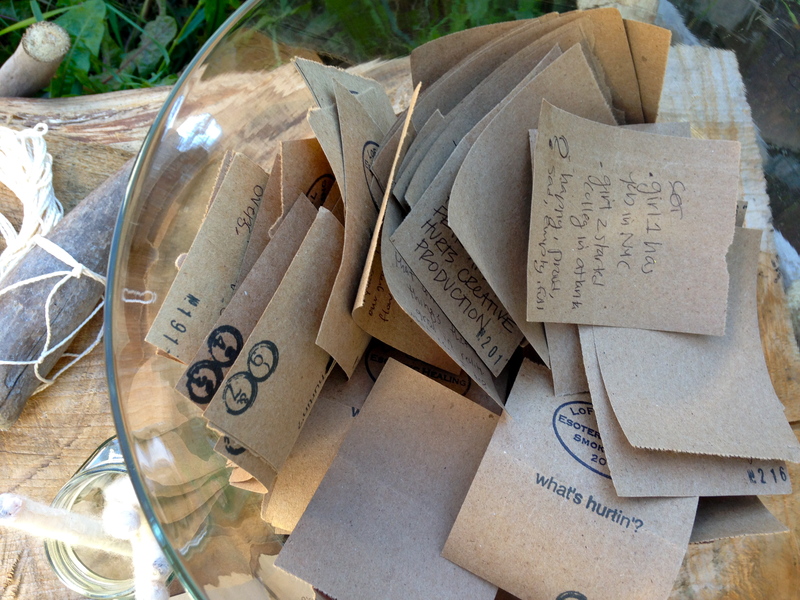 Many people visited me in the grove as the installation was part of the LoFi Festival at Smoke Farm in Arlington, WA. When I started this project last spring, I had no way of knowing how much more connected I would feel to the grove and to so many people who began as, and remain, strangers. I am altered. In my typical habitat I teach young children, volunteer quite a bit and generally look for opportunities to be helpful. These are my ways of connecting. 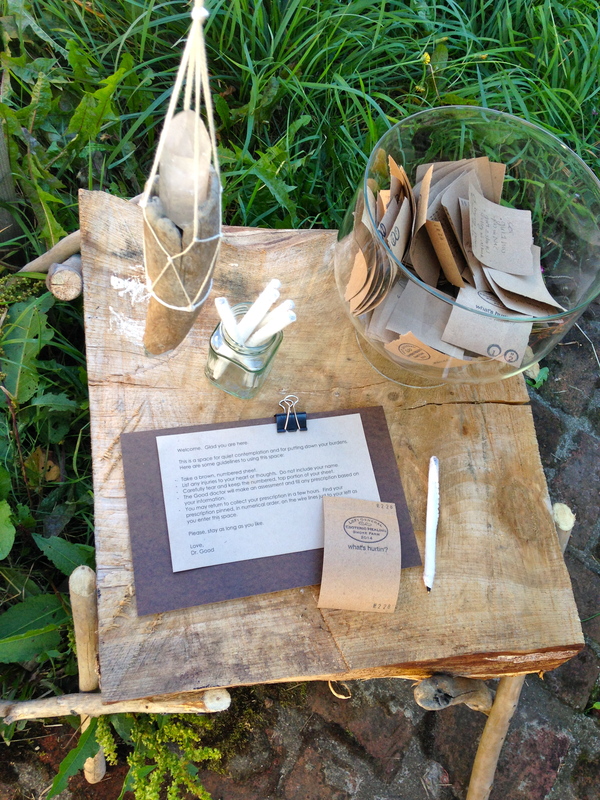 As a jumping off point for this work, I wondered if I could be useful, if I could deeply connect, by making an offering of time, tokens and undivided attention (if only for a few moments) anonymously with strangers. I found that I felt profoundly connected to people in the space and to the space itself. Though I could not see outward, I could see light, my writing and feet. I could see that people stood in the space quietly with me even after they had given me their burdens. I could hear everything. I heard how people quickly become silent in the space. I heard slow shifting and breathing. I heard people collecting their prescriptions. I strongly sensed that we were mingling our vulnerabilities and each longing for connectivity while trusting this remarkable place to keep us safe and allow this exchange – this connection. I was and remain overcome by the candor expressed in the burdens. I hoped participants would bring me heavy woes, I specifically asked for them, but I felt surprised nonetheless by the outpouring. I was also overwhelmed by the sheer number of burdens and the time a considered prescription and remedy required. I originally thought I would make short replies, attach a remedy and quickly move to the next burden. Not the case. In fact, I was able to answer and return less than 50 prescriptions during the time I had at the festival. I actually quit taking burdens for a while with hopes of catching up but it was quickly apparent that I would not be able to. Someone offered the good solution of taking the burdens home and making prescriptions available on my blog. It was an excellent solution as the anonymity (on my side) stays fully intact and that, I believe, was an essential element to the success of this project. And so, for the next couple days, I will post the remaining burdens and prescriptions. If you were at the festival and hoped for the token remedy to accompany your prescription, please feel free to contact me at info@wylyastley.com for instructions. Thank you for visiting and for participating. It was magical. 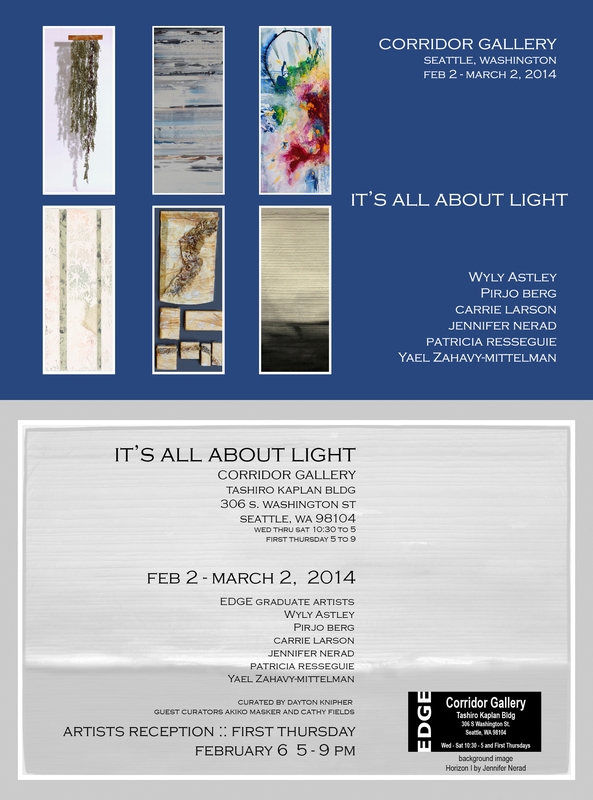 I am pleased to be included in a group show this month at the Corridor Gallery in the Tashiro Kaplan building. The theme of this show is “It’s All About Light.” For this work I used humble, natural materials and processes – nothing precious. Except time. What does the world care about a single bee, a broken man, one beetle or a family of poor migrant Okies? In our country we value bravado and audacity. We like out loud Winners. We are busy trying to be The One instead of seeing and honoring the bright light in EveryOne. 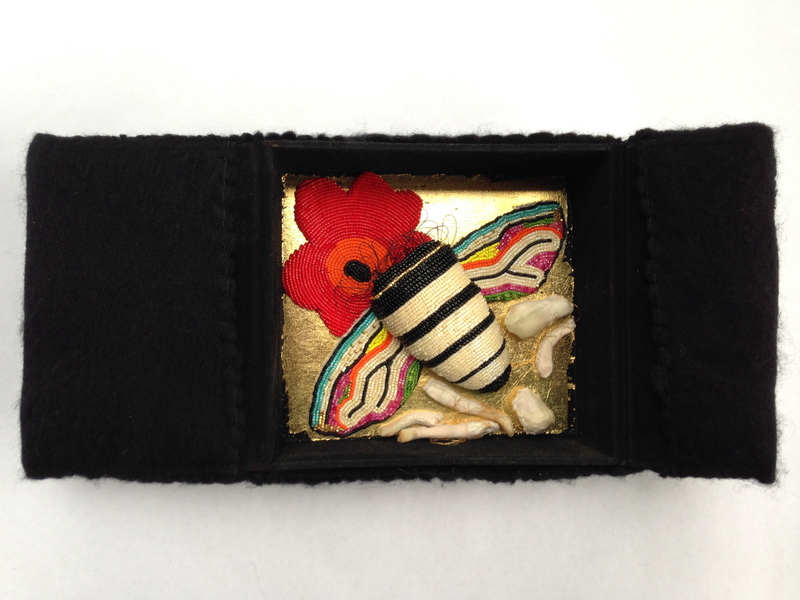 This work, each stitch and bead, is a quiet acknowledgment of these beings and an expression of love for them. I’d love to see you at the opening this First Thursday from 5 – 8 PM. I am very excited to say that I am shifting my blog into a website and it will be launched any day now. I’d love it if you came to visit me at wylyastley.com.